Apply makeup flawlessly with BeautyBeam--a hands-free way to shine professional quality lighting right where you need it. Slip BeautyBeam’s stretchable silicon band over the handle of any beauty tool to illuminate its path with soft white light. Unlike overhead lights, this beauty light won’t cast a shadow on your work area. And its naturally balanced lighting accurately shows how makeup will look out in the real world. Designed by a professional makeup team and successfully funded on Kickstarter, BeautyBeam is easy to use at home, in the car or pretty much anywhere. Attach it to mascara or makeup brushes to apply perfect strokes. Put it on tweezers to pluck with precision. Secure it on a nail polish cap and assuredly sweep color on each nail. 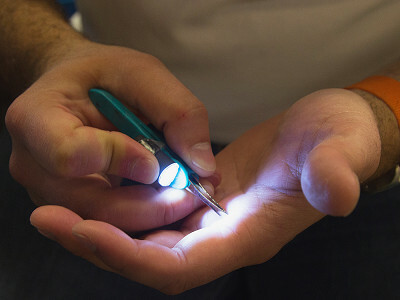 BeautyBeam is even great for tasks like removing a splinter or shaving, so buy one for the man in your life. It’s waterproof, too, so whether you primp at home or on the go, BeautyBeam is a must-have companion. Hi everyone! I'm Nussy, designer of The BeautyBeam. 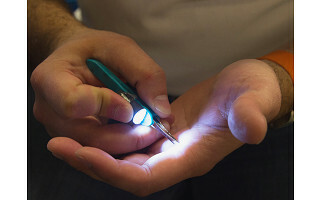 After several years working in the beauty industry, primarily designing lighted tweezers and other beauty implements, we wanted to create something useful not just limited to tweezers, but rather a beauty light that can be used with preferred beauty products. We are excited to introduce the world's first, multi-use beauty light. We'd love to hear from you and feel free to ask any questions. What kind of battery do these use? Are they replaceable? Batteries come with today's Grommet but I believe they are a special kind. Let me find out specifics and get back to you shortly. The BeautyBeam includes a non replaceable celx-170 customized battery for long life and is sealed ultrasonically, tested to be waterproof. Apply makeup flawlessly with BeautyBeam--a hands-free way to shine professional quality lighting right where you need it. Slip BeautyBeam’s stretchable silicon band over the handle of any beauty tool to illuminate its path with soft white light. Unlike overhead lights, this beauty light won’t cast a shadow on your work area. And its naturally balanced lighting accurately shows how makeup will look out in the real world. Designed by a professional makeup team and successfully funded on Kickstarter, BeautyBeam is easy to use at home, in the car or pretty much anywhere. Attach it to mascara or makeup brushes to apply perfect strokes. Put it on tweezers to pluck with precision. Secure it on a nail polish cap and assuredly sweep color on each nail.